Escaping to a serene locale for the weekend after yet another exhausting and long week is an exciting prospect. But checking into a hotel or renting a place may not sound that appealing. If you are planning to spend some quality time with your family and friends, what better way to do that than in your very own weekend getaway? Weekend homes offer you just that — a home away from home — in the setting of your choice. Sprawling serene farm houses, picture-perfect beach houses and cosy cottages tucked away in a cool hill — you can pick and choose from an array of options. A weekend home is often used interchangeably with a vacation home. But there are subtle differences. For one, a weekend-home is likely to be used more often. It is for this reason that such a property is usually adjacent to the city where the owner lives. For a nippy get-away and back, the place has to be easy to access and closer to home. While people usually love idyllic surroundings, that is not the only driving factor. People also look for ways to entertain friends and family. “Play area for kids is one of the key features many look for in a weekend home,” says N Hariharan, Head, Commercial Agency, South, Cushman & Wakefield, a real estate advisory. “Families with kids form over 60 per cent of the weekend home segment. But we are also seeing friends, young families with no kids and women coming for a short get-together,” says Raman Narula, Founder, Formula Group, provider of serviced apartments. They may prefer sports facilities such as golf courses or club houses to host parties. While popular tourist locations near cities may seem to be in favour, other locations are also picking up. Near Mumbai for instance, many are finding that Lonavla, Lavasa and Mahabaleshwar are too crowded. 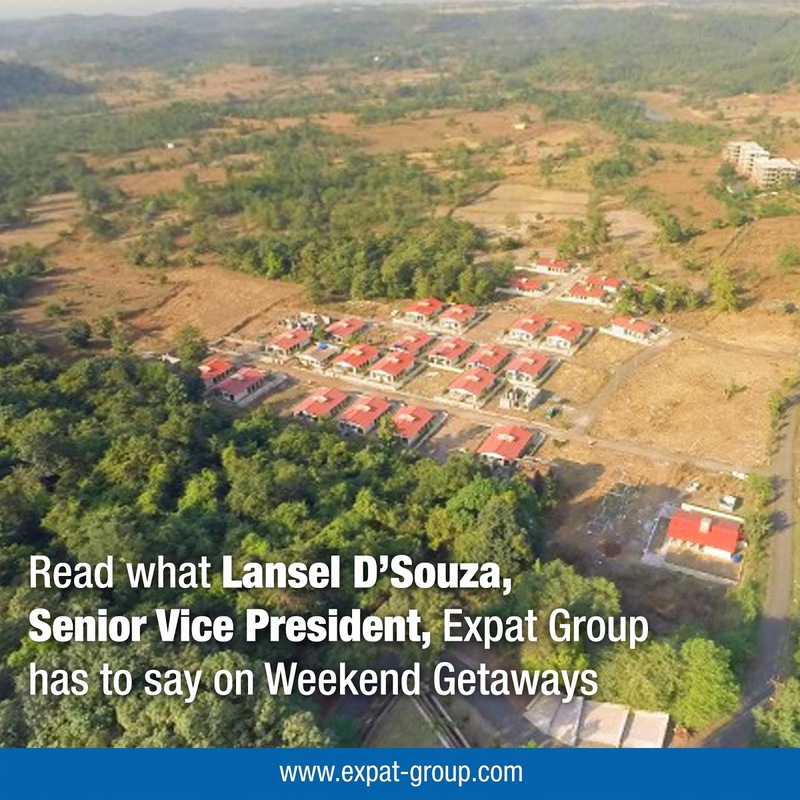 “Places such as Karjat differ from the mainstream holiday destinations — they are largely untouched locations that are still reasonably distanced from tourist locations,” says Lansel D’Souza, Senior Vice President, Expat Group, that develops weekend homes near Mumbai. While any property within one-three hours of drive is considered ideal, better road connectivity is stretching distances, notes Ramesh Nambiar, Managing Director of Bengaluru-based Nambiar Builders. “People are even open to options such as Chikmagalur and Coorg for their weekend homes,” he says. These places are around 250 km away from Bengaluru. There is a wide choice for buyers with deep pockets. You can pick between cottages, bungalows, farm houses and row houses. The price can vary from ₹50 lakh to many crores based on location, size and features. But there may be a few places where supply is limited. “Reasons can range from development restrictions to the simple lack of free land parcels,” says Anuj Puri, Chairman & Country Head, JLL India, real estate advisory. In general, as more land is available in the outskirts, developers can add more luxury features. For instance, exclusively designed villas with large courtyards in gated communities are gaining popularity, says Hariharan. Some such as Casa Grande offer sports themed community villas with facilities for football and tennis, says Arun Kumar, Managing Director, Casa Grande, a Chennai-based property developer. The projects list many standard features including swimming pools, landscaped gardens, play area, 24-hour power back-up, club house and gym. Some developers also offer additional zingers such as private pools, jacuzzi and mineral water supply. All these amenities can help you relax only if you don’t have to fret about housekeeping or worry about security. More so because weekend home locations have weather patterns that bring their own specific requirements when it comes to home upkeep, says Puri. In the past, the only option was to own an independent home. But now there is a choice of custom developed properties in a community. “Individually constructed weekend homes have to be maintained by the owners themselves and can be a bit of a hassle. In projects by developers, these issues are handled by the developer or Home Owners’ Associations,” says Hariharan. Many developers offer additional services beyond maintenance and security. Imagine finding a plumber or an electrician in far-away places, when it is a challenge even within the city. Developers help you avail of these services through just a phone call, notes Satinder Bhasin, Managing Director, Bhasin Group, an NCR-based property developer. Housekeeping services — cleaning and laundry — are also just a phone call away. In many cases, developers have tie-ups with property management service providers to offer routine upkeep. They can also keep the house ready before you arrive. You can also avail of concierge services, including organised local tours, car rentals and restaurant bookings. But before you start dreaming of your private pool party and lounging in your beach house, here are a few things you need to keep in mind. For starters, do the necessary homework on your developer and other legal aspects. “Smaller towns and cities are replete with developers who don’t put much thought into the quality of construction or even the need to get all necessary clearances for their projects,” says Puri. It is therefore, important to look into the credentials of the builder, clearances and approval of project before buying. Off-beat locations also require you to consider factors you may normally take for granted in a city. Connectivity to a market place or emergency medical facility will be critical. Finally, make sure that your mains are switched off and gas pipes shut when you lock up.